I'd personally pass on the 755 engine. You'd lose ~20% horspower and torque in the deal. Sorta like taking the 360 outa your old Ford truck, and replacing it with a 302. With only 1017 hours, I'd think a ring and valve job and a fuel delivery overhaul should do the trick on the 855 motor. Have you had the oil pan off and inspected the bottom end yet? 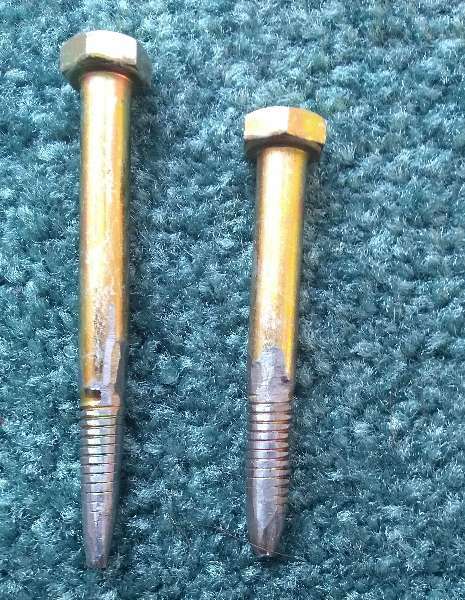 (connecting rods? )f #2 cylinder injector is weak and #2 cylinder compression is low; you could luck out and it could be that the #2 cylinder has been washed down so bad with fuel from the bad injector that the rings are badly worn. Even still, the engine should start on the other 2 cylinders. The check for cracks is a very good idea. Did you get fuel smoke when you attempted to start it before? The other item that comes to mind is that the injection pump is not properly timed and/or the cam gears are out of time. For what you paid for it you have a lot of room to put money into it and still end up on top. Get you head checked. Then pull your pistons and hone the cyl. 's Call a dealer and get some specs for tolerances. If you are too far out get the the block machined and go from there. I rebuild engines all the all the time at work and price WITH labor is normally around $3000 with parts and machine shop work. If you are doing it your self you could save about half that. Thanks all good suggestions,yes I got black smoke every time I cranked engine.I saw also toward the top of cyl. #2, #3 some round uneven steps. If your valves are hitting the pistons, they will leave round marks. For this to happen, your engine had to break a valve spring, get over-revved or suffer major damage to the timing gears. I have rebuilt 3 JD 955 motors and they are robust. There are 2 sizes of oversize pistons available if you need boring. If your engine was over-revved and the valves floated against the piston(s), then your valve(s) is(are) bent, even if it is not visible to the naked eye. Sounds to me like you have over 5,000 hours on the engine. These engines Don't have much nickle in the blocks. There is a definate ridge where the rings end about a half inch from the top of the cyl. You will need to go oversize on the pistons. perhaps .010 or .020. I'm not sure how big the oversize pistons come. This is an easy fix, and it will add new life to your tractor. If your valves are good, your losing your compression past your pistons. Perhaps broken rings too. I would magnaflux your head too. Goodluck. Thanks engineguy you are right, it look like it has moor then 5000 hrs. I poured some gas into int. & ext. no leaks, then mesured cyl. walls #2 it was .016 over & #3 .011, book sys .010 oversize. I need to call John Deere to find out if I could go .020 and they sale parts for it if not I have to find a used one. They sale a short block for $3300.and I don`t feel like paying for that.